25 years ago today, LL Cool J confidently proclaimed, “Don’t call it a comeback; I’ve been here for years,” and a classic was born. Bolstered by an MTV Unplugged performance that introduced acoustic hip-hop arrangements long before anybody outside of CAPA had heard of The Roots, LL Cool J cemented his legacy in hip-hop with Mama Said Knock You Out. Over the intervening quarter century, Ladies Love Cool James has become so ingrained in our minds as the muscle-bound mainstay of awards shows and CBS police procedurals, it’s easy to forget that he was once a scrawny Long Island kid known for rocking Kangol bucket hats and track suits. He was also up against the ropes before Mama Said Knock You Out turned him into MTV royalty. As part of its Uncovered series, Egotripland interviewed Cey Adams, a New York based artist who designed album covers for everyone from the Beastie Boys to De La Soul, served as Creative Director at Def Jam for nearly two decades, and oversaw the art for Mama Said Knock You Out. Adams discusses the concern that James brought to his meetings with Def Jam as he struggled to recover from the critical drubbing he took from Walking With A Panther, a record that was met with a lukewarm reception by the hip-hop community for being too mainstream, commercial, and generally soft. Notable about the cover is its lettering, which was hand-written by Adams; he lobbied to issue the album cover without any text on the cover, but it was deemed too experimental at the time. 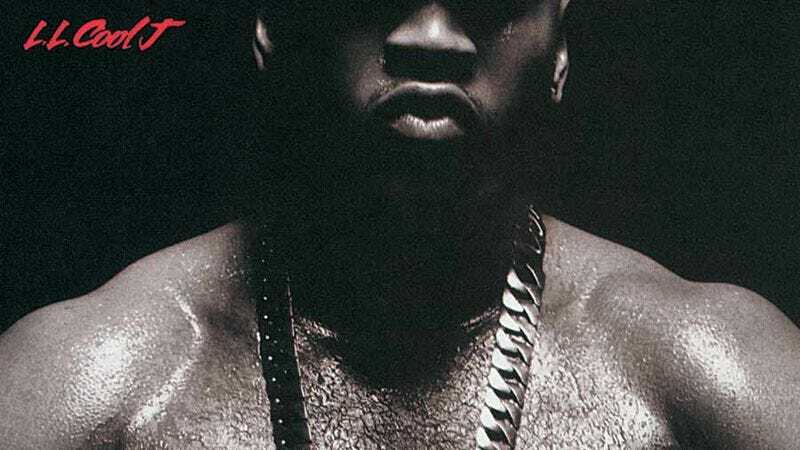 And unlike most album covers, the now-iconic image of a chiseled LL Cool J was never second-guessed. LL apparently walked in with photos from a recent fashion shoot, placed them on the desk, and it was a done deal. If there’s one quibble that Adams has with the cover, it’s that a meddling marketing executive took it upon herself to change the lettering from white to red. Minor issues notwithstanding, Adams regards the minimalist example as one of his favorite covers, while also saying it signifies a pivotal moment in LL Cool J’s career: when the rapper retired the youthful image of his first three albums and stepped out into the spotlight as both a grown man and a force to be reckoned with in the rap community.